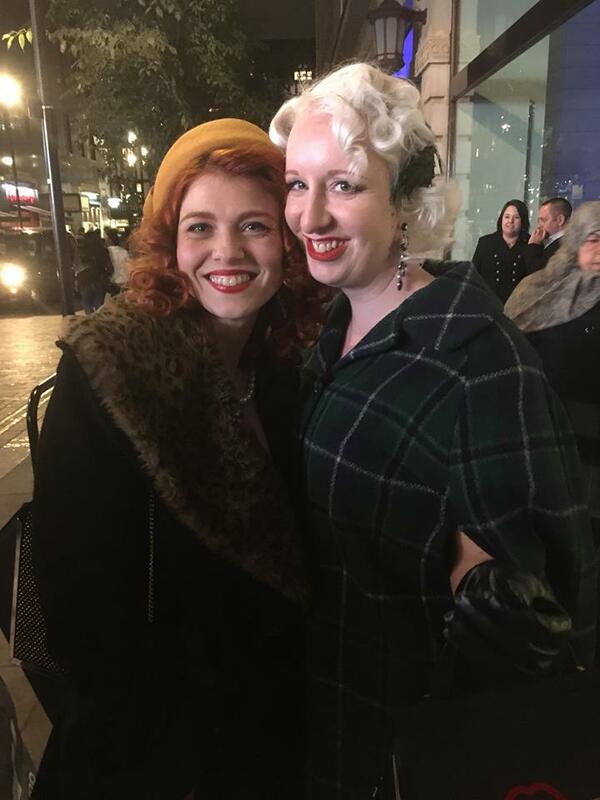 On Saturday night, I attended a Burlesque show in London. 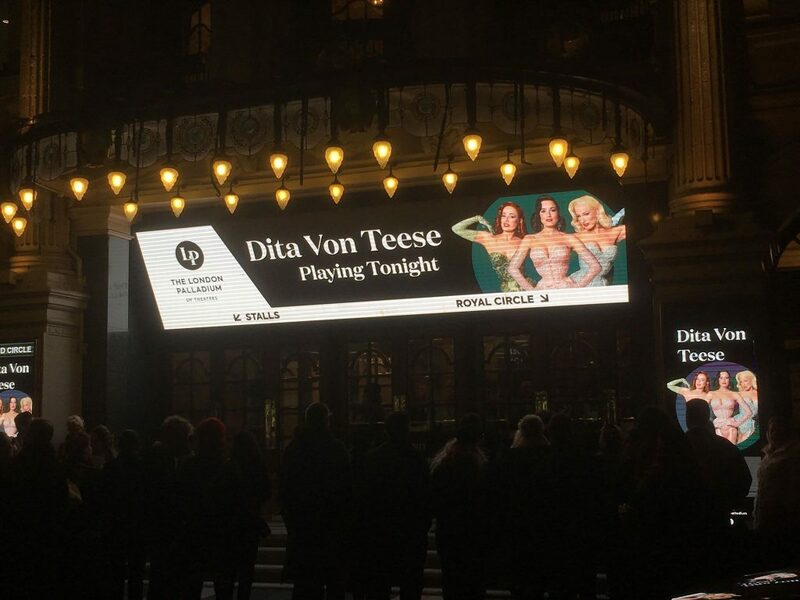 I have been to countless such shows but this one was special; the venue was the iconic London Palladium and the headline performer was the equally iconic Dita Von Teese. Not since Gypsy Rose Lee has a single name been so synonymous with Burlesque. I am willing to bet that the highest scoring name on the Pointless board – if 100 people were given 100 seconds to name a Burlesque performer – would be that of Dita Von Teese. Even if you have had zero exposure to Burlesque and have never seen a show in your life, I am certain that Dita needs no introduction. 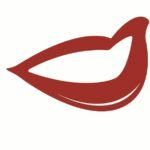 We got our gladrags on and put our best high-heeled feet forward to attend this event – in the way that we used to when I first started going to Burlesque shows all those years ago. This was a place to see and be seen, the outfits on display in the crowds were every bit as exciting to me as the show itself. I kid you not, pretty much everyone had made an effort and looked amazing. 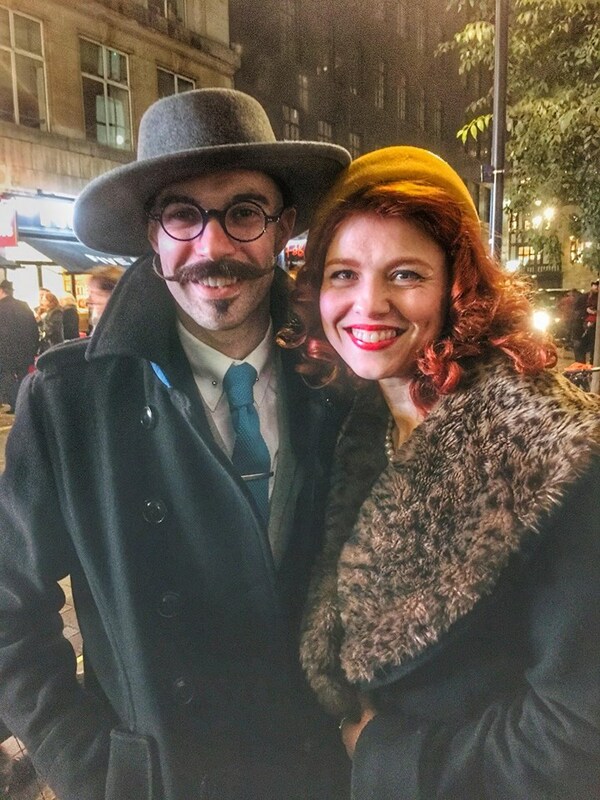 We ran into Foodies family there – the wonderful Tony Rodd (Masterchef Finalist 2015) and Becky Cummings (Pin Up Pantry) were re presenting the height of couple-goals culinary glamour. 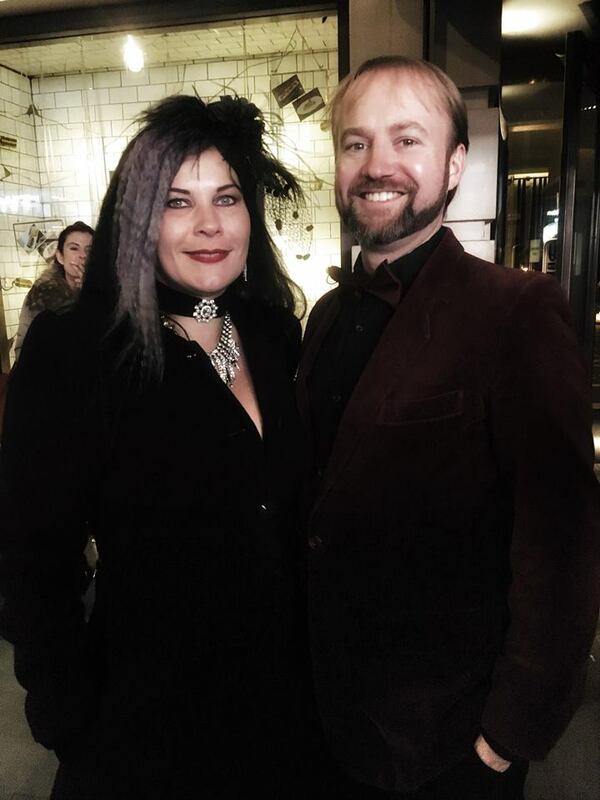 And our dear friends Liz Sutton and Nick Blackford brought all the velvet-clad gothic glamour to the Palladium. 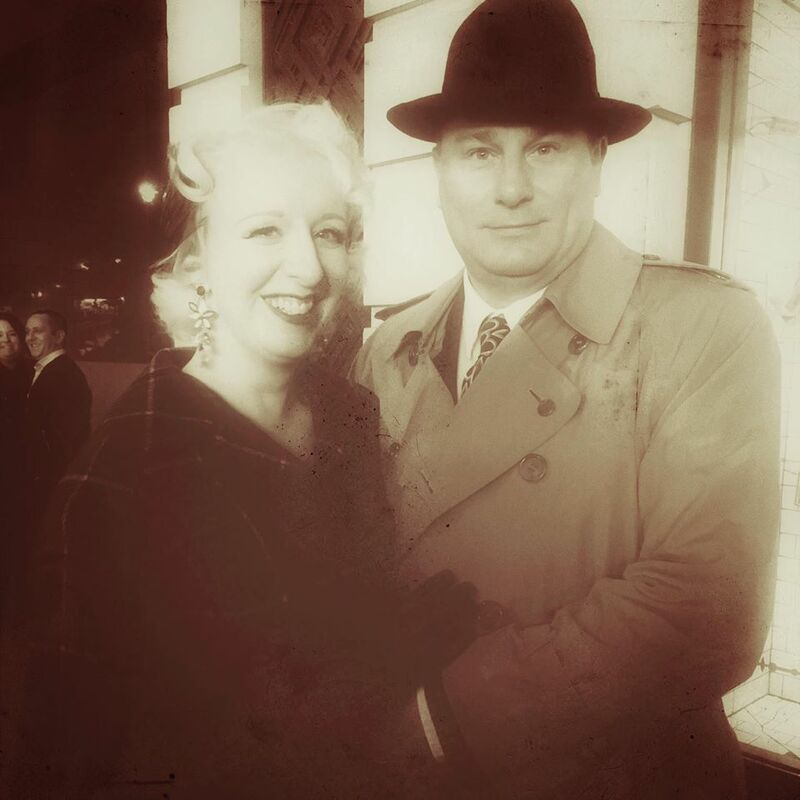 It was so retro glamorous that Chris and I actually went back in time for this picture! My darling does love a filter and I love this shot of us both. For colour, here is a shot of me with Becky. A huge gust of wind had played silly-buggers with my hair! The Art of the Teese started out as a single show that turned rapidly into a full tour once the demand for tickets became clear. I get the sense that Dita had perhaps not realised the appetite amongst the vintage-loving community to see her perform in the flesh. I think it’s a sweet indication of how unassuming this incredibly huge figure in our culture is. You still have a chance to catch the show in the UK so I am not going to spoil anything for you. What I will say is this; put your best frock on (you will not be overdressed), get to the merch stand early (as stuff will sell out and you will cry – I got there early and dropped about £30 on gorgeous things), and get into the evening. Burlesque shows are as much fun as the audience is so whoop, cheer, go crazy. We had a couple of lemons sat in front of us who really didn’t look like they were enjoying the show at all… maybe they were… I should not have let their enjoyment concern me but it did. I’ve been a fan of Dita Von Teese for many years now and have sort of, kind of, baked a cake for her already in my first book Burlesque Baking (Ryland, Peters & Small, 2014). 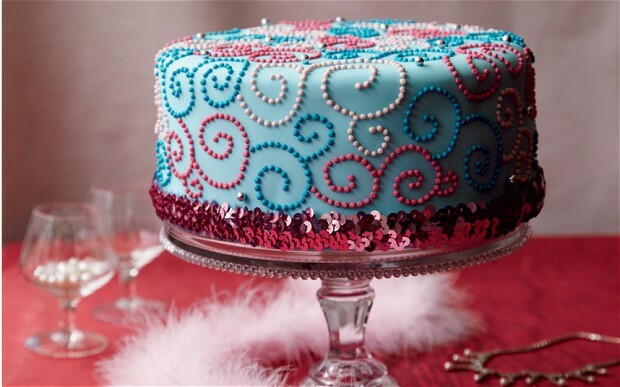 The cake decorating projects in the book were all inspired by my love of Burlesque and the performers that I admire. I designed a cake for Dita which involved many hours of meticulous piping to recreate her iconic Powder Puff costume. It’s funny to look back on now and I would love to have a chance to remake this cake in 2018. Yes, I picked up the tote bag emblazoned with this quote on Saturday night! It is true and a mantra that I think we all need to carry around with us all of the time – you won’t be everybody’s cup of tea but you are fabulous! As an art form, I find Burlesque incredibly empowering because I am a disgusting perfectionist. At any given moment in time, I can name several things that I do not like about my appearance or am seeking to improve. At a Burlesque show you will see many different body shapes all rejoicing in the performance of their art – this often feels like a distinction that I need to highlight, as a feminist, to any woman who has not experienced the beauty of Burlesque – this truly is a celebration of the body in all of its beauty and all of its silliness. I see as much joy in a woman creating beautiful shapes with her body as I do in a woman twirling her tassels in death-defying tricks. Whatever your shape and size, your body is beautiful… and wonderfully silly. Burlesque inspires me to hold myself tall and walk proud and create the image that I want to present to the world but it also makes me fall in love with all my wonderfully wobbly bits that can jiggle and dance with strategic bouncing upon the balls of my feet. If Dita Von Teese has made any other woman feel this much in love with her body, she deserves even more cake. For those of you who may be rolling your eyes at the thought of a woman with Dita’s figure eating cake, she does eat cake… she clearly just doesn’t eat it every day. You can still eat cake and be a hit on the Burlesque scene. I’ve got an awful lot of love for Dirty Martini too. I wish I had even an ounce of her confidence, grace, and skill. If you have the chance to catch The Art of the Teese and to see Dita Von Teese on this tour, grab that opportunity with both hands. If not, check out some of the smaller Burlesque events that may be happening near you. There are some amazing performers out there, all of whom will have you flipping your knickers into the laundry bin with a deft kick of a pointed foot by the time you get home! I would love to bake a cake for Dita Von Teese as a big thank you for bringing the art of Burlesque into our daily routines and for inspiring us all to be that little bit more fabulous every day.